If you have a tenant renting commercial space from you that has not paid their rent, or who have breached their lease agreement terms, you may want to consider evicting them. Eviction should be seen as a secondary step to take after other reasonable efforts have been made to work out problems with tenants. All business owners can be subject to cash-flow problems from time-to-time, but if your tenant is either unable to pay rent, or unwilling to work with you to get rent payments current, you cannot simply change the locks on their doors and hold their business hostage -- you must go through certain steps to have them legally evicted. Before you decide to evict your tenant, consider the business aspects. How long will it take you to lease the property again? Will you have to put in a lot of money for repairs? Is the tenant having momentary financial troubles or unlikely ever to get and stay current on their rent? Will you have to go to court? Once you have decided the right choice is to evict a tenant, the sooner you start the process, the better. Each day you are unable to re-rent the space is another day you are losing money on the property and another night of lost sleep worrying about things. To evict a commercial tenant for not paying their rent, you need to be familiar with the law or hire an attorney to help you file an eviction order. How you proceed may also be impacted by whether or not the business is a corporation, partnership, or the lease was personally guaranteed by the business owner. The attorney you hire should actively practice business law and preferably should specialize in commercial business transactions. The forms, laws, and processes for evicting a residential tenant are not the same as those for evicting a commercial tenant. Some attorneys charge a flat fee, others an hourly rate, but most will also charge you for court costs, filing fees, and even time you spend on the telephone with the attorney and postage and document copying costs. To avoid hidden costs be sure to ask about all fees you may incur before you retain a lawyer. Evicting a commercial tenant takes time and is often expensive. You will have an easier time proving a tenant is in arrears (owes you money) than you will for some other breach of the lease agreement. But in all cases, when evicting a tenant, the burden of proof is on you to show you have just cause to boot the tenant. Some of the special tenant rights provided by law for residential tenants are not extended to commercial tenants. Business tenants are far more vulnerable to landlord abuse than are residential tenants, but this does not mean as a property owner you can violate the laws in your state. Although federal commercial tenant bankruptcy laws changed in 2005 to favor to the landlord, individual state laws may still impact evicting a commercial tenant for nonpayment of rent. If a tenant has already filed bankruptcy prior to a landlord attempting to evict for failure to pay rent, an automatic stay in favor of the tenant will prevent the landlord from giving the tenant a termination notice or from beginning the eviction process. However, the landlord may still proceed with the eviction by asking the federal bankruptcy court to lift the stay. In most cases, the judge will lift the stay because a lease agreement has no effect on the value of the tenant's estate. If the tenant files bankruptcy after the eviction process begins, federal law sides with the landlord. However, a handful of states allow the tenant 30 days from the eviction judgment to cure the debt. 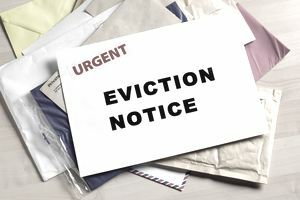 Evicting a tenant who has already filed bankruptcy, or who files for bankruptcy after the eviction process has begun can be complicated. Some laws allow commercial tenants to stop the eviction process when the bankruptcy court is involved, and in such cases, it is almost always best to hire an attorney. Do Not Accept Partial Payment: According to Minnesota business law attorneys, Jacob C. Hendricks, and Jon L. Farnsworth caution, "Landlords may unintentionally forgive a breach and be precluded from evicting tenants if partial payment of rent is accepted. Similarly, a landlord who accepts the tenant's keys prior to the termination of the lease and without any other written agreement may be precluded from collecting future rent from the tenant." Start The Court Process: Once the date you gave your tenant to pay in full has passed, your lawyer will serve the tenant with a formal eviction notice and file with the court to schedule an eviction hearing. A judge may rule that the tenant must vacate the property immediately, or may give them a few days. A judge will also likely rule and give the tenant the option of repaying the rent debt over time. The tenant may also be held financially responsible for future rent loss until the property is rented again. In all cases when you are facing evicting an otherwise good tenant for nonpayment of rent, it is wise to consider the likelihood of the tenant getting caught up on their rent. If you think the tenant can work with them. If you are uncertain, not able or willing to take that risk, start the eviction process immediately. You will be doing yourself a favor, and the tenant because the sooner you can rent the property to someone else, you earn money, and the tenant will be liable for less "loss of future rent."